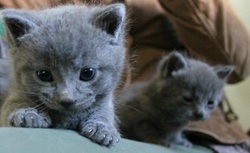 Mingus and Penelope were found at about three weeks by a good hearted woman. Her circumstances didn't allow her to keep them, so Browncoat Cat Rescue stepped up. They went into a wonderful foster home, where they were bottle-fed, socialized, and loved! One of the women that came to visit these adorable fluffballs fell in love, and took them home. Its hard to imagine sweeter, more polite kittens than these!